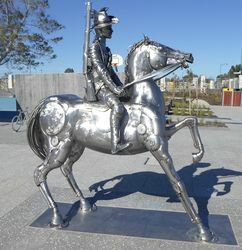 The sculpture commemorates the 10th Light Horse Regiment. The 10th Australian Light Horse Regiment A.I.F. 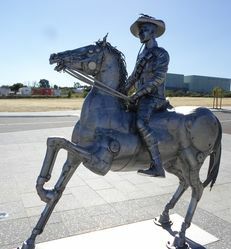 (Australian Imperial Force) was the only Light Horse Regiment recruited in Western Australia during World War One. The regiment camped and trained on South Beach ahead of their deployment from Fremantle. 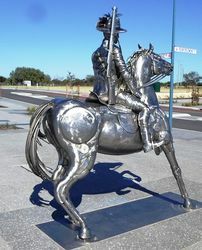 The regiment was raised in October 1914 when it became apparent that Western Australia could provide more than a single squadron of mounted soldiers. The regiment joined the 3rd Light Horse Brigade in Egypt and served dismounted at Gallipoli. The regiment’s most famous actions were the charge at the Nek on 7 August 1915, and Hill 60 on 29-30 August 1915.